“a drinkable memory quilt” or “are you happy?” [couldn’t decide.] | wull hay. December 3, 2009 December 3, 2009 / rach. So, I went to the post office the next day and much to my delight, there was a golden ticket indicating that I had a package to pick up. As I rounded the corner to the service counters, I was confronted with probably an hour-long line of people. Here is something I invented & Mom helped me make. We supported the Aussie wine economy while we thought about you there. 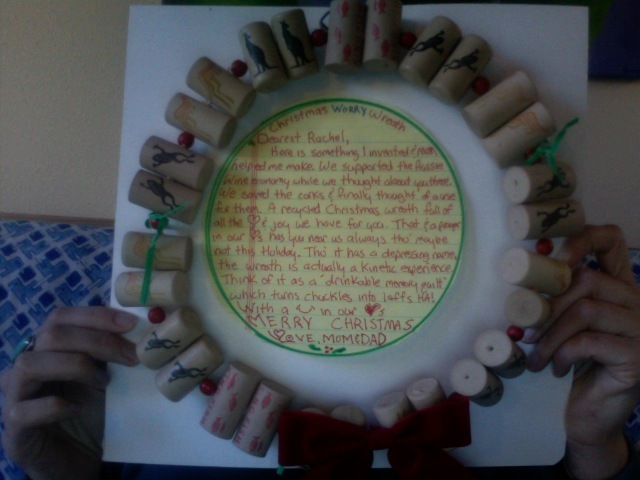 We saved the corks & finally thought of a use for all of them. A recycled Christmas wreath full of all the love & joy we have for you. That & a prayer in our hearts has you near us always tho’ maybe not this holiday. Tho’ it has a depressing name, the wreath is actually a kinetic experience. Think of it as a “drinkable memory quilt” which turns chuckles into laffs HA! With a smile in our hearts. – Oh, yes. Happy tears. – Yeah. From my dad. – Good. Not me. Just bills, bills, bills. art., memories., mi familia., my bad year., preciousness. ← not as orange as i remember, but inwardly-ablazing as ever.